Housing is the first step toward making a family safe and healthy. Doors and windows that lock keep belongings safe so that all family members can go to work or school. Bridges helps secure land titles for owners and constructs more than 60 sturdy cinderblock homes per year. Housing beneficiaries pay a small monthly fee of $10/month for 7 years into a community fund. These funds can be used by community members for small business loans, school or home repairs, health clinic maintenance, etc. Read Juan’s story below to see how building 1 home changes an entire community! and his wife Cristina live in the Sasle community of Jinotega, Nicaragua with their 5 year old daughter. Juan works as a pharmacist in the public hospital. In 2014, Bridges built a home for Juan’s family, enabling them to move out of Cristina’s parents’ house. In rural areas like Jinotega, local health centers lack resources and are frequently without medicine. Juan dreamed of opening a local pharmacy and continued working at the hospital, saving every penny, to add a storefront extension on his new home. 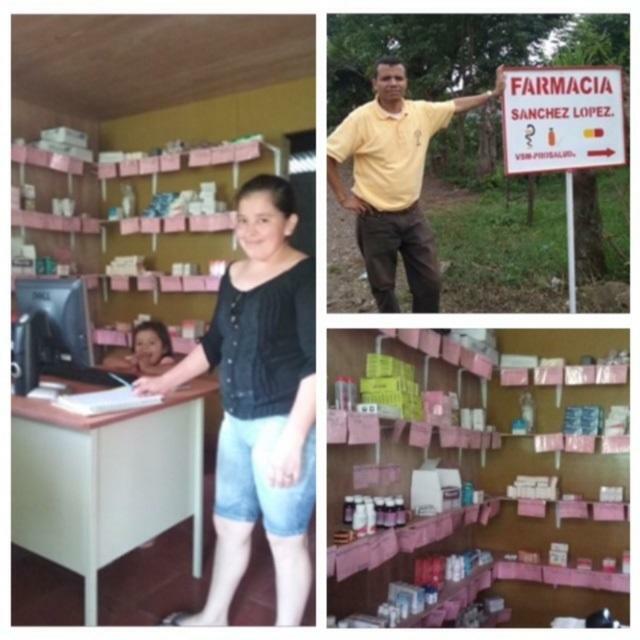 Juan was then awarded a $1,500 loan from the Sasle community fund to purchase medicine through PROSALUD, an organization that promotes the sale of low cost medicine to benefit rural communities. In June, the Farmacia Sánchez López opened and is run by Juan’s wife. “I do not want to sell for the sale, I want people get what they need and help improve their health,” says Juan. He is happy to be able to apply his experience as a pharmacist and contribute something positive to the community.